>For more Weather Snippets, visit the Facebook Fan Page today and become a Fan! Mid-90s for New Orleans, LA yesterday, Mid-90s for Burlington, VT today? I see Hammond, Louisiana took the crown for warmest in the country yesterday with a toasty 99 degree high. Today it doesn’t appear that Louisiana is going to be quite as warm but current reading are in the upper 80s across the central Gulf Coast states as of 1.45pm CT and of course the heat index will make it feel that much more uncomfortable as a classic summer pattern is now firmly established. Today generally sunny skies and highs of 85-90 should be the high from Beamount, TX to Mobile, AL. Low to mid-80s from the rest of the Deep South. New Orleans warmed to 94 degrees yesterday, however today the notable heat will be more over the Northeast’s I-95 where highs should creep about 90 for the DC to Boston corridor and up in Northern New England, though highs topped the upper 80s to even low 90s yesterday and Montreal seeing 90 and Ottawa seeing a heat index over 100, it appears that northern Vermont may see highs top the middle 90s today! Burlington, Vermont may see a high there top 95 degrees. IS THE MAJOR EASTERN NORTH AMERICA HEAT FIRST, COMING TO BRITAIN LATER? As the record heat that’s engulfing the eastern half of North America intensifes over the Northeast today, and Britain has now dramatically cooled off from the weekend’s heat, are we going to see a type of setup where the heat hits the US East and then 2 weeks later it’s builds over W. Europe and the UK? I am predicting June to see some true heat return, similar to what we just had. Note folks that though we’re back in the 50s and lows 60s for the north and low to upper 60s for the south, we are still on the dry side, we aren’t seeing system after system roll in off the Atlantic like we could be seeing…. This pattern looks to me like we’re going to increase the heat with each fresh warm surge and those cooldowns in LATE JUNE onwards will grow less cool after the heat hits.. What I mean by that is, we’re going to see perhaps 70s and 80s for Scotland and Northern Ireland as well as perhaps the north of England and Wales. 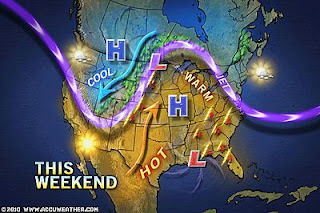 Points south should warm into the 80s and even low 90s.. This “heat surge” rather than lasting 4-5 days in May should last perhaps 10 days and then in July progress towards 2-3 weeks of well above normal temps with a 3-6 day “peaking in temp”… The cooldowns in between perhaps 3-5 “warm surges” between June 10 and August 20 should see temps return to nearer normal or even slightly above normal, NOT BELOW… Dryness should play a big factor in how warm the temps become across Britain…. NOTICE: Due to my driving test tomorrow I may have either no Weather Talk tomorrow or a shorter version, it depends on how much time I shall have…..